I am a foodie at heart. I love cooking, learning new techniques and of course, eating. When I read about the new high end Italian restaurant opening up, Bottega Trattoria, I knew I had to try it when it opened. I've read other reviews of the restaurant that are all positive and the following is my unbiased opinion, the good and the bad. It is important to note the restaurant only opened 5 days prior to our visit mainly serving lunch. The restaurant is located in the former Olympia restaurant downtown Saskatoon (#yxe) on 2nd Ave. While this location was considered a problematic area, the neighboring McDonald's recently closed and the downtown core has been home to newer retailers and chains. The renovations took less than 4 weeks and there is little reminiscent of its former occupant outside of the interior arches. In terms of size, the restaurant is reduced by half it formerly was making it more intimate. There is an addition adjacent to the restaurant where we were told they are still unsure what they are going to use it for. The color scheme is a mix of white tiles that flank a side wall with black benches, chairs and ceiling with wooden tables and dark wood flooring. The restaurant has few wall decorations and zero televisions. The majority of the tables seats larger groups with fewer tables of two. I would have expected more tables of 4 allowing the restaurant more flexibility when catering to smaller groups as we were seated at a table for 6 and it was just the 2 of us. When we arrived for dinner they were having troubles with their air conditioner even after spending approx. $200,000 on renovations. It was quite warm making our meal slightly uncomfortable and it was observed other tables were experiencing the same discomfort. Currently the restaurant does not have a website (at the time of this review) but uses Facebook to market themselves. Their Facebook page is well laid out, probably one of the best Saskatoon restaurant pages I have run across. Their photos are professionally taken and the page is informative, relaying the daily features. 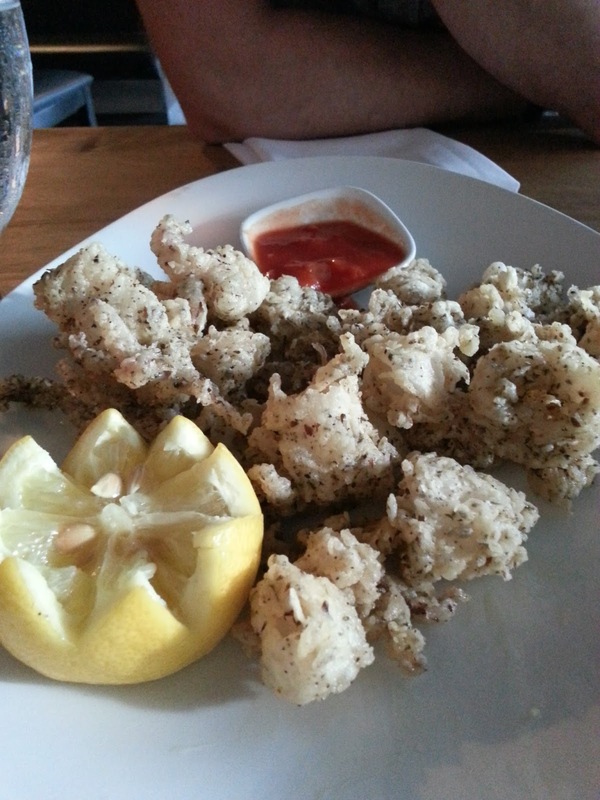 According to their Facebook page, the restaurant is owned by Master Chef Amedeo Vallati who was born in southern Italy and has traveled extensively throughout the world. He earned his masters in Florence and certification in butcher and meats in Austria. He owned a restaurant in Montreal and an Italian bistro in Halifax before settling in Saskatoon. Upon entering the restaurant we were greeted by Jayce Tomyn who previously worked at Carvers for 15 years. He was quick to seat us as it wasn't too busy and our waiter was knowledgeable about the menu and wines. They were attentive during our meal and ensured we were well stocked on water and taken care of. They didn't have a drink menu yet but was more than willing to accommodate us with whatever drink we wanted. We both ordered a Negroni which was good. Our waiter was very knowledgeable and listed off the wines they currently had stating they are still working on having Italian wines shipped that you can't get in the liquor stores. The dinner menu is quite large and each night there are 3 features that varies daily so you know you’re not getting served leftovers. The restaurant prides itself on using fresh ingredients and making its own pasta and breads. It will be interesting to see if they are able to keep up with demand with such a large menu while still making things fresh and from scratch. There are a few vegetarian options, mainly salads and they are able to create gluten free meals upon request. Our meal started with the Chef's complimentary sample consisting of a risotto ball stuffed with ham atop of a tomato based sauce. 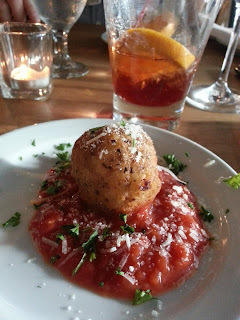 This was quite delicious and a good start to our meal. We ordered a few appetizers, calamari and a Caesar salad. As we stated we were splitting these appetizers they were gracious enough to split the salad into 2 portions which were fairly generous portions. 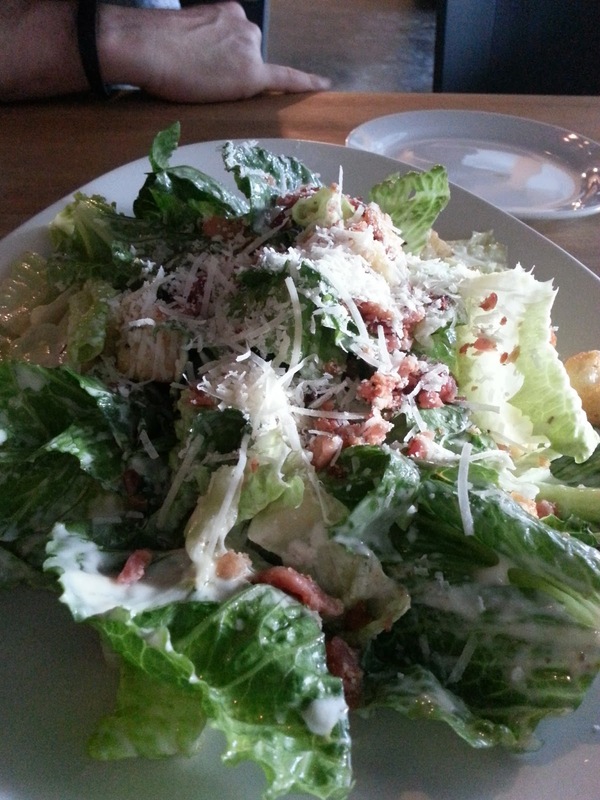 The salad dressing was nice and light with a hint of anchovies consistent with Italian cooking. The calamari came with a marinara dipping sauce which was quite delicious. 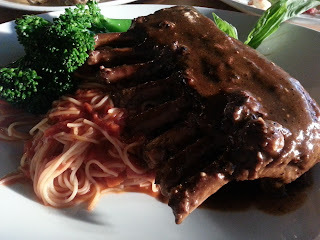 For our main course, I selected the rack of lamb prepared medium rare and my husband had the spaghetti and meatballs. My lamb arrived while we were still working on our appetizers and I was a bit disappointed to find it rare inside and requested it to be cooked some more. I’m not sure what the rush was in cooking our meal as it wasn't busy that night. The chef felt badly and we were compensated with a free dessert. 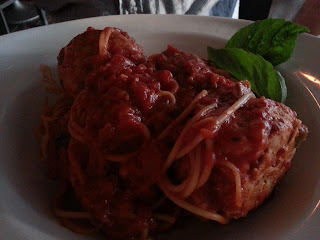 John's pasta came with meatballs that you could tell were homemade and were fairly large in size. When I finally had a chance to eat my lamb they recooked my critic would be that it was very salty. The lamb was covered with sauce like it was a rack of ribs and overpowered the flavor of the meat. I would recommend reducing the salt and smearing the sauce on the plate with the lamb sitting on top as the lamb should be the star of the meal. John also reported that his pasta was over seasoned as well. The restaurant considers it to be a high end eatery and the prices reflects this. Wines by the bottle ranges from $50-$100 and it's hard to say if this markup is reasonable or not as they are serving wines you can't get in liquor stores (though I can't recall if he said their current supply is from the liquor store while they work out the logistics of shipping in unique wines). My lamb was priced at $30 in the menu but upon paying for it discovered it was a misprint as we were charged $40. I pointed this out and the waiter was more than willing to refund the difference as he forgot to mention the misprint. For the amount of lamb you received, I would say this is reasonable as it's a full rack of lamb and cooking it at home, I understand lamb is expensive to buy. I was expecting with the high prices they charged that the food would be a tad better. Another surprise was the price of their pizzas. They offer 2 sizes, 10"/15" and the prices ranges from $18/$38, with one seafood pizza at $100. I didn't try their pizza so I can't say if it's worth it or not and I'm not sure if Saskatoon is ready to pay for pizzas at these prices. With all the new restaurants popping up, especially downtown, it will be interesting to see how this one makes out in the long run. As we were there during their soft opening I would be willing to eat there again but am apprehensive as to how they are going to keep up with such a large menu.